This rather misses the point: gold is protection against government induced inflation etc. If the dollar or whatever implodes, gold/silver are money. 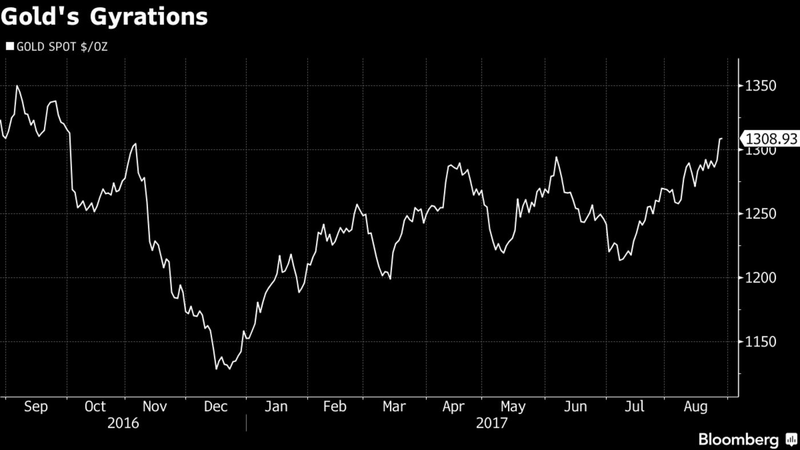 Having waited patiently for the “any-minute-now” moment, gold investors are taking comfort from the recent rise in price in response to geopolitical tensions. Yet the responsiveness of gold, as well as the overall price, appears weaker than would have been expected from historically based models — and for understandable reasons. The precious metal’s status as a haven has been eroded by the influence of unconventional monetary policy and the growth of markets for cryptocurrencies. Gold prices rose almost 1 percent on Tuesday morning as part of the risk aversion triggered by yet another brazen North Korean missile launch over Japan, together with uncertainty as to how the U.S. may respond. But trading below $1,330, the overall response of gold prices to the last few months of heightened geopolitical risks has been relatively muted, particularly as the 10-year Treasury bond, another traditional haven, saw its yield trade down to below 2.10 percent that same morning. Two immediate reasons come to mind, one related to several assets and the other more specifically to gold. First, and as I have discussed in several Bloomberg View articles, the prolonged pursuit of unconventional measures by central banks has helped meaningfully decouple asset prices from underlying fundamentals. In such circumstances, historically based models will tend to overestimate the reaction of asset prices to heightened geopolitical tensions — including the fall in risk assets such as equities, or the rise in gold. Second, a portion of the traditional buyer interest in gold has been diverted to the growing markets for cryptocurrencies, which are also benefiting from a general increase in demand. As such, the returns to investors there have been significantly greater, sucking in even more funds. The message for investors in both gold and multi-asset-class portfolios is clear. While continuing to play a role in diversified market exposures, gold is less of a risk mitigator and asset-class diversifier, for now. Luckily for investors, the need has also been less pronounced, given that ample market liquidity has boosted returns, repressed volatility, and distorted correlations in their favor. But this is not to say that gold’s traditional role will not be re-established down the road. After all, central banks are in the later stages of reliance on unconventional monetary measures and, given this year’s spectacular price appreciation, cryptocurrencies are more vulnerable to unsettling air pockets. I’m adding a position in the Gold Miners here at circa $19 and change. They are pretty volatile, so there should be plenty of opportunities to trade around the position.